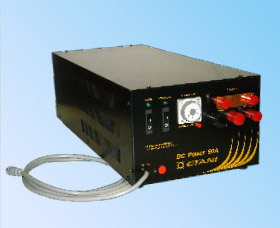 The DC Power 60A is a direct current power for car audio. It is a great power model designed to sufficiently operate a complete car audio system, which is composed of a digital power amplifier. It has a great output voltage of up to 60A or more. As it is utilized under the same condition as car audio, the instrument can be used by connecting in parallel with the battery.